Pre-hung doors commonly come with both door and door frame combined in a pre-made package from the hardware supply store. Such pre-hung doors are mass manufactured to standard specifications. To install them, a contractor must remove the previous door frame before installing the already assembled door frame into the door opening. But if the pre-made door frame does not fit the door opening, or if the door opening is irregular or unusual in some way, additional complications can arise, potentially resulting in a less-than-perfect installation outcome. For this reason, IDRC does not use pre-built, pre-hung doors that are commonly found in hardware stores. Rather, our resources and expertise allow us to custom-make each and every door frame, ensuring a perfectly fitting door frame that accommodates the unique circumstances and conditions of each door opening. Compared to using manufactured pre-hung doors, our custom approach ensures the best possible appearance, workmanship, and door operation for the home owner. 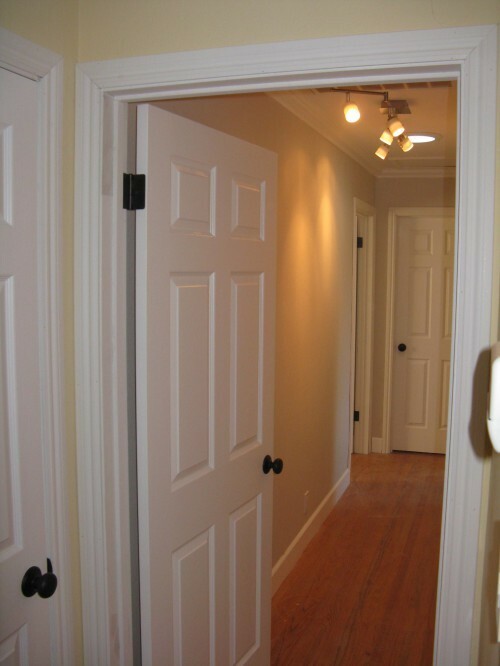 Installing pre-hung doors involves replacing not only the door, but also the pre-existing door frame and molding. This is a somewhat messy and labor-intensive process. In contrast, retrofitting a new door into the existing door frame involves merely removing the pre-existing door from its hinges and replacing it with a new door slab that has been measured and cut to fit the existing door frame. 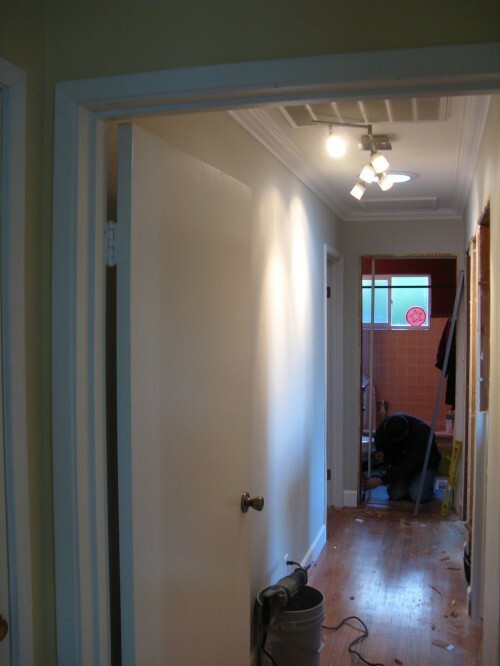 For general contractors, a door retrofit project (i.e., replacing only the door slab) can be almost as labor-intensive as installing a pre-hung door, but fraught with more uncertainty due to the irregular dimensions of many existing door frames. For this reason, many general contractors will insist on installing pre-hung doors, even if the existing door frames are in perfectly good condition. But for IDRC, the door retrofit process is extremely easy and cost-efficient due to our digital measurement and computer-controlled door cutting technology. Particularly in older homes, the existing door frames may be rather plain looking, especially in a home that has been graced with elegant crown molding. Installing pre-hung doors provides an opportunity to replace plain-looking door frames with more attractive and fashionable molding. New door frames can add even more appeal and charm to a home, beyond that of just adding new doors. We offer a number of different molding designs that fit the fashion and decor of a wide variety of home environments. Another potential reason for pre-hung doors is that the existing door frames may have been damaged from abuse and/or movement and shifting in the home that naturally occurs over time. For older homes, installing pre-hung doors provides an opportunity to once again have doors that are perfectly rectangular in shape. The downside of pre-hung doors is the additional time and cost involved with not only installing the new door and door frame, but also in removing the pre-existing door frame. Installing pre-hung doors involves more mess and noise, and is more disruptive than just performing a door retrofit. For many homeowners, a door retrofit is the preferable option. IDRC’s advanced digital measuring technology and computer-controlled door cutting machine makes a door retrofit a much more cost-efficient approach. Our milling machine cuts and prepares each door to precise digital measurements, allowing our installation crews to replace each door within about 15 minutes. Why IDRC For Your Pre-hung Door Needs? Interior Door Replacement Company is the one-stop resource for all door replacement needs. Our experience and expertise provide our customers the option to choose from either pre-hung doors or door-only replacement approaches. 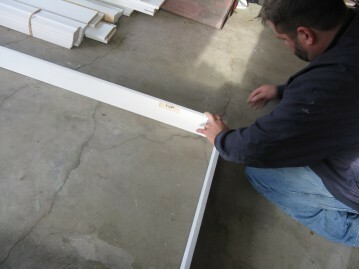 In addition, we are the choice for many customers who need both pre-hung and door slab-only replacements. Because we are experts in both approaches, we can provide objective and professional advice to help our customers decide on the best approach for them. In contrast, general contractors are not equipped with the advanced digital measuring technology that we possess. 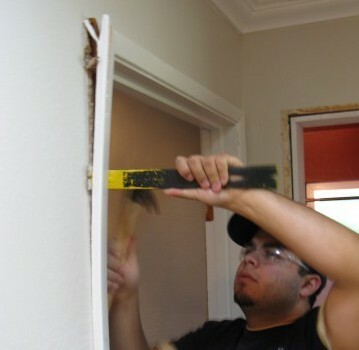 To avoid the uncertainty and frustration involved with manually cutting and trimming a new door slab to exactly fit the irregular measurements of a pre-existing door frame, some contractors will automatically steer their customers to install pre-hung doors at a higher cost, even in homes with door frames that are in perfectly good condition.